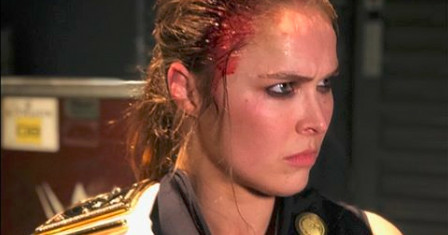 At Elimination Chamber the Raw Women's championship match and segment ended with Becky Lynch being behind with her hands behind her back, Charlotte Flair struggling to get back to her feet and Ronda Rousey scowling with blood dripping down the right side of her face. It was a pair of errant crutch shots from The man which left Ronda wearing a crimson mask to go with her Sonya Blade – inspired gear (and if you allow me to do some digression here , Lynch's look was not Kill Bill where Uma Thurman's The Bride was a yellow track suit with black stripes a la Bruce Lee's Game of Death jumpsuit, but instead was more the Hollywood-influenced New X-Men uniforms of the early aughts). And if Rowdy was seriously injured by Becky's swings the way Lynch was at a Nia Jax punch which missed the mark back in November, we're having a whole different discussion today. … according to Wrestling Observer Radio, she was checked for a concussion and "apparently" with good to go by the WWE medical team. So we can stick to just debating how they present Stone Cold Becky Lynch, if they did Ruby Riott dirty, how great Ronda looked (or to what The Man was trying to pay homage), etc, etc., etc.